As you enter this inviting home, you'll notice cathedral ceilings with crown molding, Travertine tile floors, a chair rail separating designer colored walls, and a warm fireplace. The kitchen has been completely remodeled, including new cabinets, granite counters, stainless steel appliances, a breakfast bar, and a wine fridge. Plentiful windows in the kitchen and family room bring tons of natural light into the home. Highlights of the upstairs include a large master bedroom with a gorgeous, spa-like en-suite master bathroom that has a hand-tiled shower with rain shower head and seamless glass enclosure, shaker-styled cabinetry, and a massive walk-in closet. Upstairs has two other bedrooms and a large loft space easily convertible into a 4th bedroom. The second upstairs bathroom has also been upgraded with new cabinets and granite counters. Additional highlights include gorgeous wood floors, crown molding, recessed lighting, and ceiling fans in every bedroom, as well as a large laundry room complete with a utility sink and extra cabinets. Perfect for entertaining, the backyard has an outdoor kitchen with multiple seating sections, and with a lovely decorative water feature. 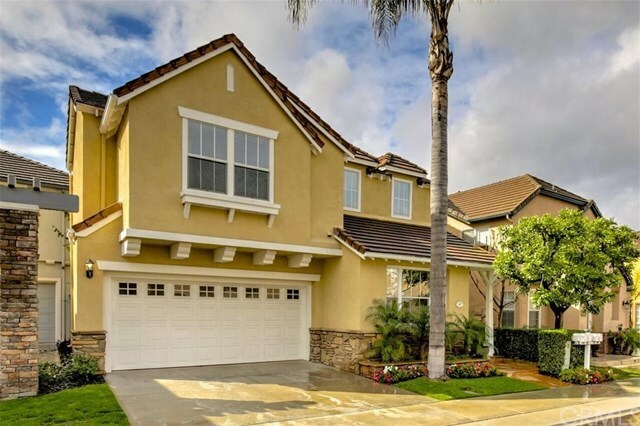 The Village Cottages community is a gated enclave that includes a relaxing pool area, and is walking distance to Oak Park, Canyon Vista Elementary, and Soka University. Directions: From Aliso Creek & Pacific Park, take Pacific Park to Wood Canyon & turn left. Left on Boundary Oak, then left on Weybridge. Pass through gate, turn right, then first left onto Edmonton. Right on Wellington, left on Seven Kings. Home is on the right.